I am currently busy with an entirely unrelated project but found the time this weekend to hammer out fixes for few issues that were brought to my attention with classic EBXL builds. These updates are in testing and will be published to Curse once I receive confirmation from the affected users that everything works for them. Until then, I’m going to post them here. Fixed log renderer registration to avoid some issues when running on servers. Fixed name generation for certain leaf blocks. The old (lazy/broken) behavior was causing problems with Veinminer, Factorization, and probably other mods. Moved stack trace logging when an unfamiliar build of IC2 is detected. So, there are usable builds of the mod available to the public. Some dozen people have even downloaded the thing and are presumably wondering what all the fuss is all about. After all, the code isn’t public yet, and I haven’t even replicated all of the features of the original EBXL components I am recreating. Both of these will change quickly. As far as source visibility questions go, I am currently developing in private Gitlab repositories visible only to the core EBXL team. This is the result of a few problems we had doing things the more traditional way during EBXL3.14-3.16’s development cycle. There’s no reason to go into specifics right now, but chief among the problems was the issue of account ownership. I have full control of the Gitlab account, so can do what I need with it. 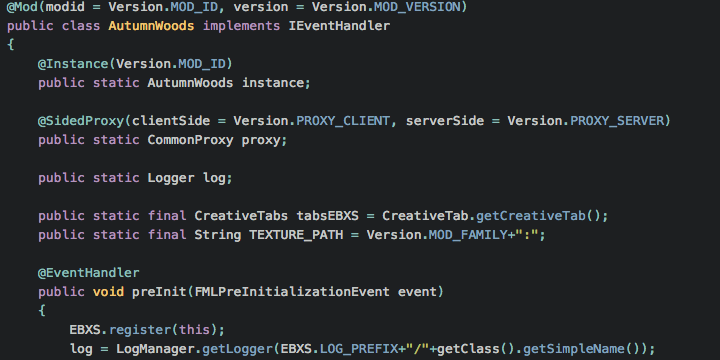 In a few days, when I have multiple submods preparing for a shift from alpha to beta status and am happier with the way the core mod works, then I will make the code visible to the public – and will gladly begin accepting PR’s there. It will still likely be hosted on Gitlab for the time being, but that could change. 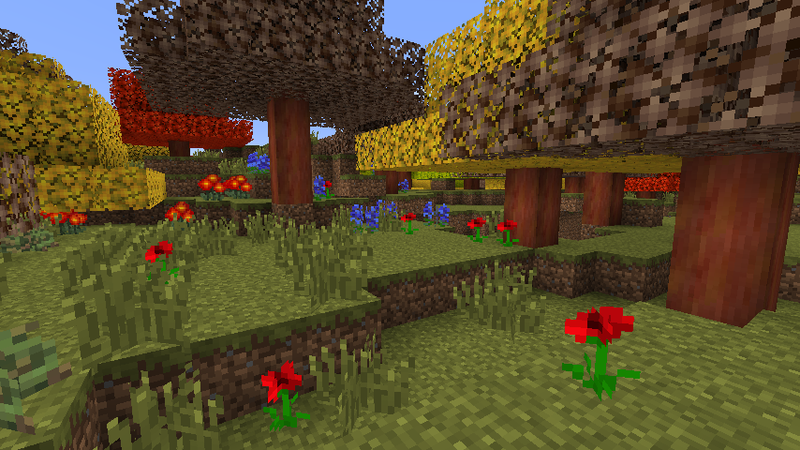 That said, the next submod I am going to start work on is Meadows. This is largely because there are no fundamental features of the planned Meadow mod that I do not already have implemented as part of either Core or Autumn. Once Meadows is in alpha, I am hopeful that Zenth will have caught up on the art backlog, and I will be able to resume work on adding onions and mushrooms to Autumn. And that’s it. We will add a few basic recipes for each of these raw ingredients – ie, while you will be able to eat them raw, it will be possible to process them further to improve their nutritional value. 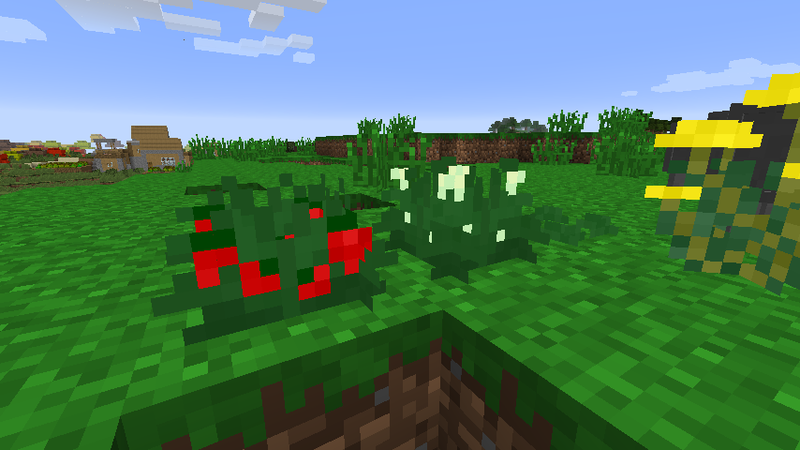 We have dozens of fruit trees and other crop types planned – but none of those will go into base biome mods. They belong in the farming submod that I discussed a year ago. Well, now that’s more like it. We have flowers and trees. 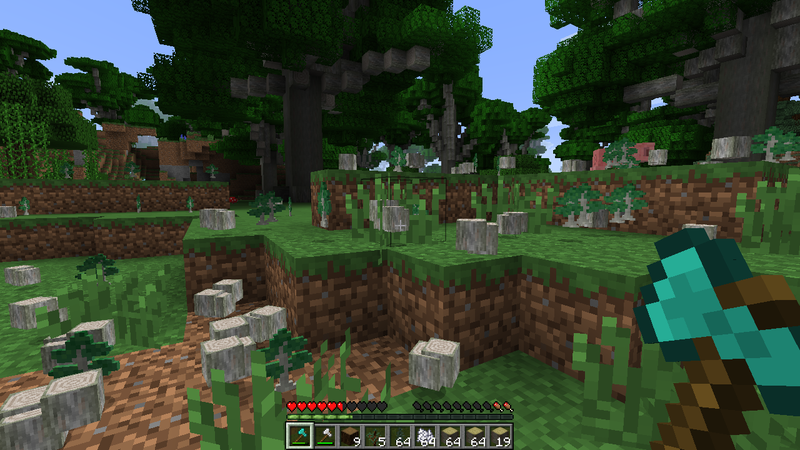 The trees drop the right kind of saplings, and those saplings can be used to make more trees. 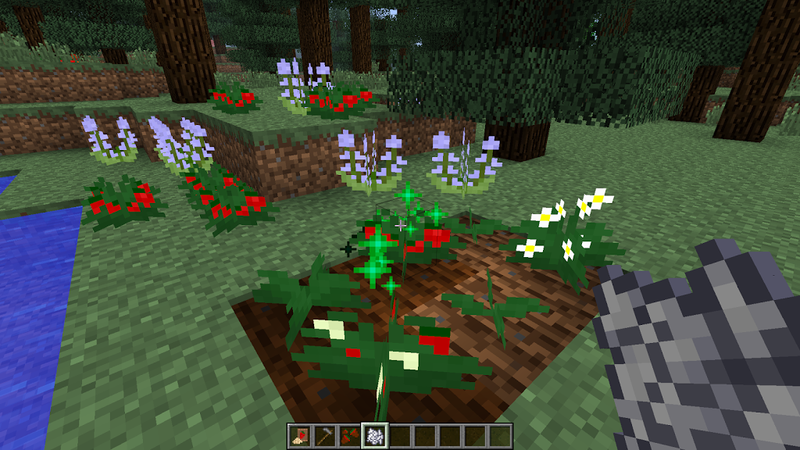 The flowers aren’t usable as dye yet – and the custom autumn wood furniture isn’t available yet, but this is a good point to have reached, and I will be releasing the first public alpha of Core and Autumn today for those who want to mess around with things. Add a few more flowers. Add a few new types of mushrooms. Add japanese maple and sakura trees. Make tree generation more cpu friendly. Flesh out remaining recipes for wood and flowers. Add upstream version checking to Core. Once I’ve knocked all of that out, we’ll declare the Autumn submod feature complete. While I’m waiting for some art, I will be starting up on the Meadow submod. Hopefully, I will be able to spin out a basic alpha of it very quickly since it doesn’t require very much in the way of new logic. The alpha builds will be listed on Curse, NEM, and here soon. See here for download links. This post is a technical look into the mod’s development process and may not be of general interest. You have been warned. I’ve been officially working on the Extrabiomes rewrite for a few days now, and am on track to release a very broken alpha build for people to play around with on Friday. Because so much behavior will be duplicated between the planned submods, and because so much communication is desired between them, I am implementing as much logic as possible in a separate mod – Extrabiomes:Core. If installed by itself, Core won’t offer very much functionality. Eventually, I have plans to add some general biome tweaking options to Core that will allow you to modify vanilla behaviors and the like – but that isn’t a high priority right now. One of the biggest things Core will do is eliminate redundant logic for things like config files and tree generation. This way, we don’t wind up in a situation where we are maintaining 12 different mods, each with 12 different copies of my improved leaf decay system. Instead, they will be able to hook into Core for that. It certainly isn’t a new idea, any time a single developer or group has to maintain multiple similar products they are likely to consider doing this sort of thing. The other thing Core does is allow me to communicate between mods. I have written a system that allows submods to fire off events to inform Core of their features or ask Core for its status. Right now, I’m not doing anything terribly exciting with it. 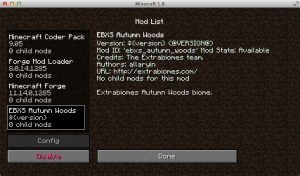 For example, Autumn Woods is registering itself with Core and Core then actually handles registering the biome with Minecraft. 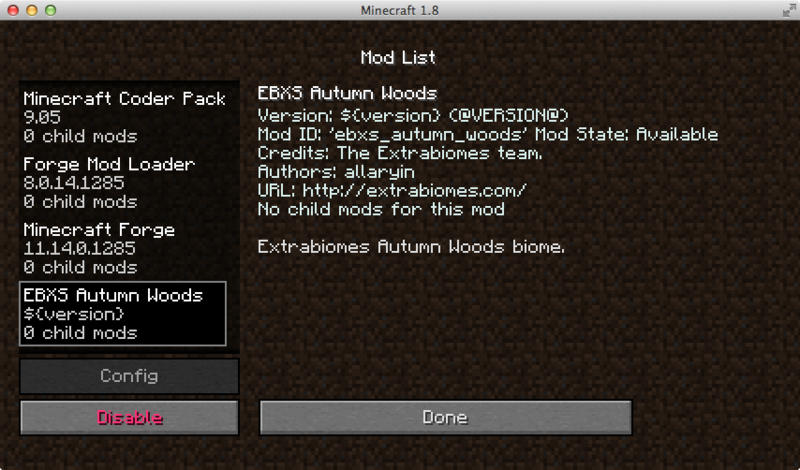 Additionally, Core keeps a list of every biome any registered submod provides, so when Autumn Woods needs to choose a biome id, it asks Core. If I implemented Meadows with this system (which I will soon), Core would know the biome ID’s requested by both mods and would be able to log a conflict just a little more intelligently than if there was no communication going on. It’s not much to look at yet, but it will be more interesting very soon. I plan on implementing flowers tonight and will write trees tomorrow. It’s been entirely too long since we’ve had a release here, and that is completely my fault. But you’re all tired of me beating myself up about that sort of thing, so we’ll just dispense with the drama. This is a maintenance/bugfix release. It contains numerous small changes that have happened since 3.16.1 was quietly released two weeks after 3.16.0 was released last october. Added the ability to disable quicksand to the config file. Also added the ability to disable cracked sand, but this behavior is currently untested if you leave wasteland biomes enabled. Added the ability to disable “legendary” oak generation to the config file. Fix for disabled Forestry backpacks crashing things. As far as why I’ve been so terrible about getting these releases out to the public, well, that’s partially due to what I’ve been working on for the future of the mod.